When you brush or floss your teeth, it may be normal to feel slight discomfort or swollen gums. You may even have a tooth that acts up when you drink your favorite cold beverage. No matter the cause, you need to know the top five warning signs that you need to see your dentist right away. One sign that a majority of patients ignore is their gums bleeding after flossing or brushing. Weeping gums are not a normal byproduct of maintaining our oral health. In most cases, inflamed gums are a symptom of a bigger issue beneath the surface. If your gum line has shrunken down or is falling away from your teeth, you have an oral health issue. Gum disease or periodontitis is a serious health concern. You need to to see your dentist as soon as possible to reverse or heal the damage that has already been done. This condition could lead to much more serious oral health conditions. As children, we used to get excited that we were about to lose a tooth. As adults, a loose or shifting tooth is cause for concern. Your teeth should be solid and in place. They should not shift around or be loose in their socket. If you notice this, you need to see your Malta dentist immediately. A dry mouth is a sign that you may have a larger oral health issue. Your mouth should be well lubricated with saliva to wash away food and keep your mouth in proper functioning order. If you experience dry mouth frequently, it’s time to see your dentist. Bumps and sores can be a sign for a variety of oral health issues. They can also be a sign of systemic (whole-body) health issues. These sores or bumps could appear on your tongue, inside your cheeks, on the roof of your mouth, or around the base of your teeth. The best approach to discovering what these bumps or sores are from is to ask your dentist once you see them for your scheduled appointment. 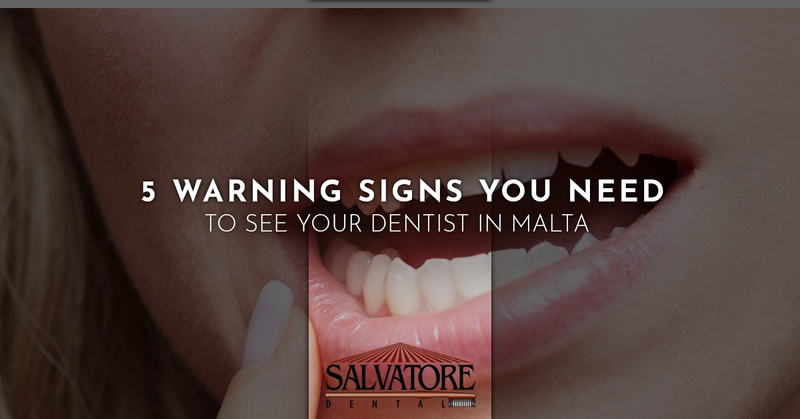 At Salvatore Dental in Malta, we take our patients’ oral health seriously. We strive to create a calm, comfortable dental office so that our patients feel safe and at ease. We’re here to serve you. Give us a call today to schedule your appointment and get your oral health back on track.